Thanks to their dynamic spring properties, NORMACLAMP® FBS springband hose clamps are the perfect choice for hose spigot systems that are exposed to significant temperature fluctuations. Once installed, NORMACLAMP® FBS clamps ensure an automatic re-tensioning effect for an extended period. Even at low temperatures, this mechanism still enables sufficiently high levels of radial clamping force to be achieved, which in turn ensure excellent sealing reliability. With NORMACLAMP®FBS clamps, even hoses that are exposed to significant temperature fluctuations or have a tendency to “creep” can be joined securely. 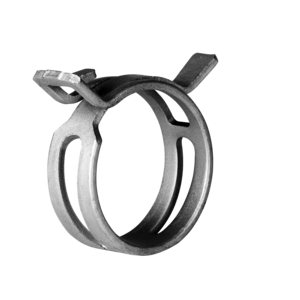 A springband hose clamp with dynamic spring properties, which ensure an automatic re-tensioning effect. It is particularly suitable for use with hose-spigot joints which are submitted to extreme temperature changes. Manual or pneumatic tools are used for professional installation.